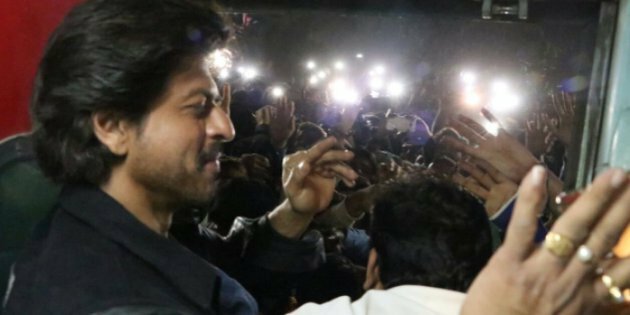 Vadodara, Jan 24 (IANS) One person died of cardiac arrest when he went to catch a glimpse of Shah Rukh Khan at the Vadodra railway station, teeming with fans of the Bollywood superstar, who arrived here on board the August Kranti Express on Monday to promote his upcoming film “Raees”. Social activist Farid Khan Pathan of Hatikhana area of Vadodara, who arrived at the railway platform with his wife and daughter as the family was an avid follower of the actor, fell unconscious after suffering a cardiac arrest at the railway platform. He was rushed to hospital where he was declared dead on arrival, his family members confirmed. Earlier, reports said he felt suffocated during a stampede at the railway station and then suffered a heart attack. The police resorted to lathi-charge to disperse the crowd during which some persons sustained minor wounds on their head and face. Two constables of the Railway police also collapsed during the chaos and are undergoing treatment. They are said to be out of danger. The Bollywood actor is travelling with the film’s director Rahul Dholakia and producer Ritesh Sidhwani from Mumbai to Delhi on August Kranti Express train to promote “Raees” which hits the screens this week on January 25.